AzhwAr meditated upon these aspects; but since it it did not end in union with emperumAn, he became greatly anguished; seeing that the noble ones and the caring ones became sorrowful and AzhwAr explains his emotions to them just as a nAyaki (consort of emperumAn) in separation from her consort krishNa, having visualized his divine limbs but could not physically experience him, became sorrowful and explained her emotions to her friends and mothers who set out to advice her. 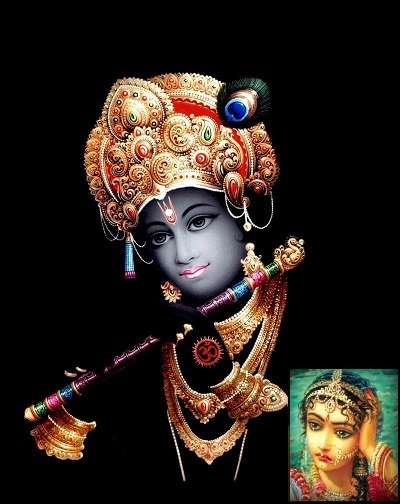 In the previous decad – AzhwAr meditated upon emperumAn‘s physical beauty as in “malgu neelach chudar thazhaippach chenjudarch chOdhigaL pUththu oru mANikkam sErvadhupOl – andhara mEl sempattOdi undhi kai mArbu kaN vAy – senjudarch chOdhi vida uRai en thirumArbanaiyE“; such beauty became well established in his heart and having enjoyed it thoroughly, due to that relishable mood, emperumAn was fully visualised where the visualisation matched physical presence, and AzhwAr stretched his hands thinking emperumAn is present in front of him only not to find him there; he became very sorrowful and started mercifully speaking in the mood of a pirAtti (consort) who united and separated from sarvESvaran, and is suffering due to uruveLippAdu (visualisation/hallucination). A pirAtti [parAnguSa nAyaki] who is suffering in separation after union with sarvESvara; when a man unites with a woman, usually it starts with eye-contact and then extends to other interactions; hence – first parAnguSa nAyaki meditates upon the beauty of his divine eyes, and through that she meditates upon his face and subsequently desires for further interactions but becomes sorrowful since her desires did not materialise immediately; her friends and mothers observed her state and asked her “what is going on with you?” Her suffering became so great that it could no longer be revealed to some while hidden from others. Hence, she said to all of them “The beauty of his divine face both part by part and fully, is coming and tormenting me”; she heard from those who advice and despise saying “This way of speaking does not match your femininity; it does not match his supremacy too; it does not match your nature of caring for us as well; so, you give it up”; she replied “the way it torments is not a match for your angry words, to make me withdraw myself from it; now, I will just keep thinking about what I am impacted with; hence, you should just give up on me” highlighting that they should give up attachment towards her, and her helpless state. AzhwAr keeps going through the following emotions in thiruvAimozhi – desiring for sarvESvaran‘s qualities, that being an internal experience, desiring for the qualities other than those which were enjoyed, not being able to be patient in enjoying them, and that makes him forget his previous state. What is explained more in this decad which talks about the visualisation? While the previously acquired clarity was present, new desire dawned in him which turned out to be the visualisation. In other places, only after losing the previously acquired clarity, he will acquire new desire. Even in thiruvAimozhi 5.5 “enganEyO“, the same experience was undergone by AzhwAr. What is the difference between there and here? There – AzhwAr is having both joy and sorrow equally and here sorrow is more. [For example] The harm caused by emperumAn‘s divine eyes makes AzhwAr address them as “iNaikkURRam” (pair of death). This entry was posted in thiruvAimozhi, thiruvAimozhi 7th centum on October 6, 2018 by Sarathy Thothathri.